Kevin's Meandering Mind | What If You Met All of Your Virtual Friends? What If You Met All of Your Virtual Friends? My wife and I took a personal day (no kids!) last week to visit MassMoCA, a huge and expanding contemporary art space in the Berkshires of Western Massachusetts. It was my first visit there (see yesterday’s Slice of Life for what I saw) and as we wandered around huge galleries in an old manufacturing facility, I was amazed by the depth of the artwork (and we even got a chance to try Virtual Reality Goggles for the first time, too, which was a neat immersive experience). One of the exhibits that caught our attention was by Tonya Hollander, whose Are You Really My Friend? seeks to break down the barriers between the “friends” we make in online spaces and our interactions out here, in the worlds beyond the screen. 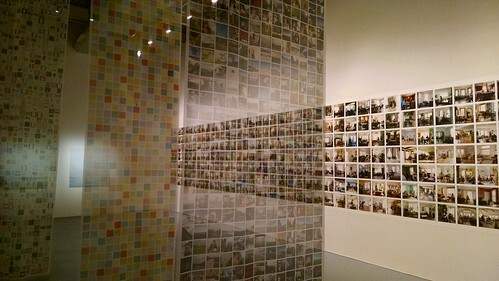 Hollander decided to visit, with her camera, all 626 of her Facebook friends, documenting her journeys. Along with photos, she has sticky notes from folks, stuff given to her along the way, documents of her journey, and much more. The exhibit itself is multi-layered, in interesting ways, with translucent banners of artwork hanging from the rafters of the room. It’s fascinating to see how she breached the wall between our virtual identities and our offline identities. I was struck most by the humanity of the exhibit. It’s easy to lose track of the stories behind those who choose to follow us, and those we decide is worth our time to follow. Can you imagine spending fives years on a journey of documentation? Can you imagine how powerful that would really be? How it would strengthen your network? Given all of our worries about how digital spaces are dipping towards chaos and negativity, the act of sharing our lives with a stranger, who becomes a friend, reminds us of why many of us went online in the first place: to find our Tribe and connect with others, and to expand our own notions of what it means to be a citizen of the world (or World). This entry was posted in CLMOOC, DigCiz. Bookmark the permalink. Your post is so encouraging, Kevin. It’s comforting to know that the small stories are real and reveal our humanity amidst all the negativity you mention. It is the humanity, isn’t it? The bridging. It’s powerful. I love this story Kevin; thank you for sharing it. For me it speaks more to the harsh realities that we have in “real” environments just as in “digital” environments. Citizenship is a horrible word they tell me. It has this horrible history. It is divisive. It is used to tear us apart. The digital and the real are not apart from one another – you are creating a false binary. Still, I see we need to belong to something and still I see the problems with belonging. Still, I see these separations where the digital impacts the “real” and the “real” impacts the digital. I think that it is complex and that this is a great example of the environment affecting the individual. I also think that we often think we know people in one context and then find they are different in a different context. I think that this makes us angry sometimes because we expected them to be the same but really it is not fair to ask this of them. Just my (maybe a little more than) 2 cents. I love your cents. Yes, the project captures so much of identity, right? The perceptions we have of others. What others have of us. I keep thinking, she spent years doing this, arranging meetings and, how powerful that must have been for her, and for them. There’s a whole section of Sticky Notes that are fascinating and then all sorts of ephemeral materials that she collections. Taken together, Are You My Friend? is an eye-opener. my #sol17 post was me wandering around Yuma PHA with my new smartphone taking pics, hoping my example and images instead of words will encourage other cell phone users to do more — and share. Some are on Facebook, do email, but most senior connectivity is mobile. Awesome idea … images can close the gap.